Rio Grande’s Taylor Webb scores the go-ahead run on a wild pitch in the fourth inning of Wednesday’s game two win over the University of Northwestern Ohio at Rio Softball Park. The RedStorm defeated the Racers in the nightcap, 6-3, after suffering an 11-3 mercy rule-shortened loss in game one. 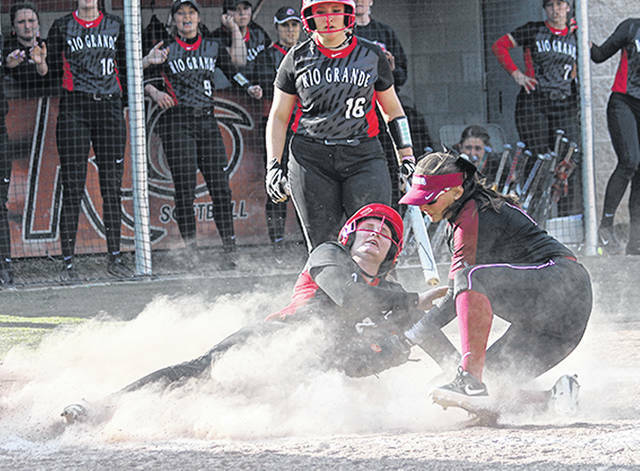 RIO GRANDE, Ohio — After seeing its long home winning streak snapped in an opening game loss, the University of Rio Grande made sure that a doubleheader sweep at the hands of the University of Northwestern Ohio wasn’t in the cards. The RedStorm rebounded from an early 3-0 deficit to post a 6-3 win and earn a split of the twinbill with the Racers, Wednesday afternoon, at Rio Softball Park. UNOH posted an 11-3 mercy rule-shortened victory in the opener, snapping a 41-game home winning streak for Rio that dated back to April of 2015. The RedStorm, who were among the teams receiving votes in the latest NAIA coaches’ poll, finished the day at 13-9. The Racers, who were also among those receiving votes in the coaches’ poll, closed the day at 10-4 with the split. For a while, it looked as if UNOH was poised to hand the RedStorm consecutive losses at home for the first time since a doubleheader sweep at the hands of Georgetown (Ky.) College on April 23, 2014. The Racers scored once in the first inning and twice in the third inning to take a 3-0 lead, but a two-out, three-run home run off the bat of freshman Kenzie Cremeens (Ironton, OH) – her team-best seventh circuit-clout of the season – knotted the score at 3-all. Rio then took the lead for good with a pair of runs in the home fourth. Freshman Taylor Webb (Willow Wood, OH), who led off the inning with a double, scored on a wild pitch and senior Carly Skeese (Newark, OH), who reached on a one-out error, scored on a single by sophomore Kayla Slutz (Navarre, OH). The RedStorm closed out the scoring with an insurance run in the sixth inning thanks to back-to-back one-out doubles by sophomore Mary Pica (Minford, OH) and Skeese. Sophomore Raelynn Hastings (Commercial Point, OH) overcame a shaky start, blanking the Racers on just one hit over the final four innings for her eight win in 12 decisions. Hunter Conzelmann started and took the loss – her first in four decisions – for UNOH, allowing five hits and as many runs over four innings. Shayla Munyan had two hits, including a double, for the Racers, while Kendall Benning and Grace Jackson drove in one run each. In game one, UNOH exploded for six runs in the fifth inning and three runs in the sixth inning to snap a 2-2 tie and deal Rio its first loss at home since dropping a 7-3 decision to Carlow University in the second game of a doubleheader on April 14, 2015. The Racers jumped to a 2-0 first inning lead, parlaying a pair of RedStorm errors into two unearned markers. Rio tied the game in the home fourth thanks to an RBI single by Pica and a run-scoring groundout by sophomore Morgan Santos (Dayton, OH), but UNOH lowered the boom against Rio senior starter Kelsey Conkey (Minford, OH) in the fifth. Kennedy Arndt and Munyan opened the frame with back-to-back singles before Conkey rebounded by striking out Benning and coaxing Jackson to force Munyan with a fielder’s choice grounder to second, but Joey Brinegar and Carson Baymiller hit back-to-back home runs – on consecutive pitches – to give the Racers a 6-2 lead. Mackenzie Watson added a two-run double later in the inning to push the advantage to 8-2. The RedStorm got one of the runs back in the home fifth on a two-out, bases-loaded walk to Pica, but the comeback threat fizzled moments later when UNOH starter Aubrey Brunst induced Skeese to flyout to right field and leave the bases full. The Racers set up the mercy rule with three more runs in the eighth, two of which came on RBI doubles by Jackson and Baymiller. Baymiller finished 3-for-4 with two RBI, while Brinegar was 2-for-4 with four RBI in the win. Munyan and Eleya Montroy added two hits each. Brunst improved to 5-2, allowing eight hits and a pair of walks in a complete game effort. Conkey slipped to 4-3 with the loss, allowing 14 hits and 11 runs – nine earned. All 11 runs she allowed came with two outs. Conkey and Skeese both had two hits in a losing cause. One of the hits by Skeese was a double. Rio Grande is scheduled to return to open a four-game, River States Conference road swing on Friday afternoon at Ohio Christian University. First pitch for the opening game is set for 3 p.m. The RedStorm’s road swing also includes a trip to Newport, Ky. to face Cincinnati Christian University on Saturday afternoon.